I have always said that Emma Samms - young and older - would be my ultimate Claire. Well this morning, Jenn M - who will be with Tracey, Shannon and me at ComicCon, YES! - sent me this photo of Katherine Heigl with dark hair. So you can imagine the double-take I did when I looked at the photo. Let me ask you this: If Gwyneth Paltrow can win an Oscar for her stellar performance as an English woman in Shakespeare in Love... why can't Katherine Heigl do a bang-up job in Outlander? Only time will tell... I realize. But she's no fool. If these rumors are true, I bet she's brushing up on her British accent right now. ooooh Julie - I'll have to check that out. I always love coming across a Gerard Butler movie I haven't seen. Please tell me he uses his own accent! There are definately some American actors who can do a great Englih accent. Being English myslef and ready to leap on any and every over emphasised vowel (Keanu Reeves in Dracula anyone!!?) I have to say Gwyneth Paltrow did a fantastic job in Emma and Shakespeare in love. However I would love them to choose an English actress just because as a Brit you pick up any and every slip, even the fabulous Gwyneth ocassionally (and I mean VERY,VERY ocassionally) 'over drawls' the odd word. I'm nit picking I know but I just don't want the film to be as good as it can be! And as I've said before, it's less about the job she could or couldn't do (she's NOT a bad actress, IMO) and more about the perception/weight she carries in the business. Here's the difference between her and Gwyneth--when she did Shakespeare in Love, Gwyneth known for a) doing featured roles in smaller movies and b) being Brad Pitt's g-friend. KH, on the other hand, is known for being a TV star (and somewhat tempermental at that) and rom-com princess. I just don't think that she's got the pedigree at this point in her career to take on the lead role in what is, if not exactly Masterpiece Theater, at least something that is higher brow than your average Judd Apatow or Ashton Kutchor flick. If I were KH or her people, I'd push her for Geillis. It's a great part, but a featured part--the whole movie isn't on her shoulders, but she'd have the opportunity to ease herself into the kind of project that she probably wants to be considered for--and possibly steal the movie with a great performance. wouldn't Emma Samms have been a great Claire!!! I loved her - too bad she's not still young and could be considered!!!! But you know what I think Katherine Heigl would do fine - its the Jamie casting I'm so worried about!!! Its going to be so important who they pick!!! I saw a clip of Emily Blunt in Young Victoria and I totally thought "She could totally be Claire"!! So I have to watch that movie now to get a better idea of her acting skills! Well, my only concern with KH as Claire is the height. I believe she is about 5'9 or 5'10 which would be good portraying her as "big" compared to women of the time; however, Jamie would have to be even larger. I don't know if it would work. DG always explain how they fit & so forth. I wouldn't want her to take away from the bigness of "Jamie". I just wish the powers that be making the film had started with the mindset of casting a British actress for Claire. It's not like there's a dirth of talented women on the scene with impressive bodies of work to their credit. Not going to do the 'list', but for those fans who had mentioned Kate Winslet many times but felt she's too old - she's 35 today. Happy Birthday, Kate! Heligl is 32. I'm not one hung up on age per se for the actress chosen, but why not start with authenticity? Again, there are many extremely talented, verra bankable British actresses currently on the scene, aye? "Emily Blunt in Young Victoria" Yes, I saw that movie and she would be wonderful as Claire. A face that can play young and old. Ooh, I forgot about Emily Blunt! She was really good in the Devil Wears Prada too! And she's married to Jon Krasnicki from The Office:) Oh, and Timeline the book by Michael Crighton is awesome! A movie won't do any of these books justice though. We need a series on HBO/Cinemax/Showtime! Let's get a petetion started! I just want to tell you that the link you posted for the Utube Video ALWAYS puts a smile on my face!!!! 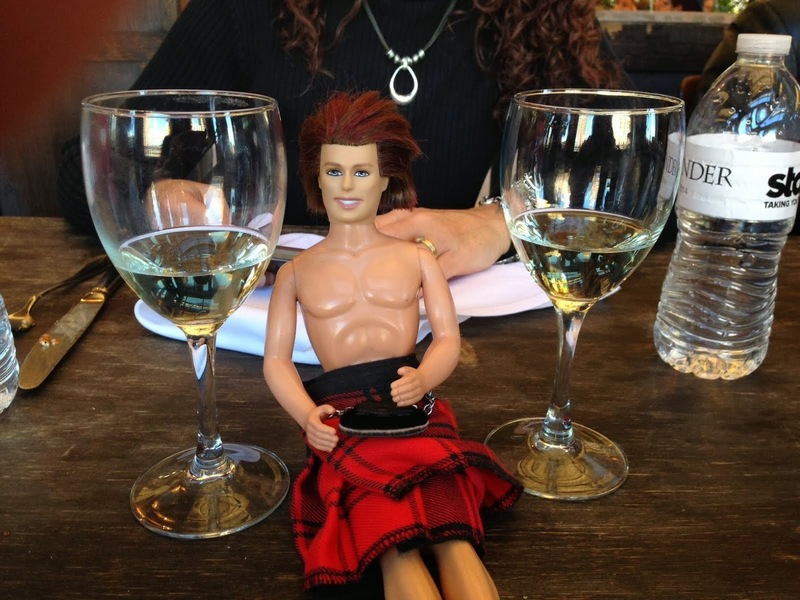 Pocket Jamie, Scottish music, Margaritas... all GREAT! Re: KH, we'll see. Not my first choice (Kate Beckinsale anyone) but who knows. Tracey, she DEFINITELY wins second runner up of Miss America 1985! I was just watching some old movie on TV with Keanu Reeves and saw the actress Dina Meyer - she is pretty close to how I picture Claire in my mind...curly hair and all - just needs the whiskey eyes! JaymieJ: You're not the first to suggest Dina Meyer (whom many of you might know, as I do, as the psycho professor's wife who Brandon had a fling with on 90210 back in the day). I'm thinking she's not the right age--prolly right between younger and older Claire--but she certainly has those curls!!! I just love playing the casting game! The most fun is picking certain actors and actresses from their prime even if they are too auld now like you did with Emma Samms, Carol. The fashion police definitely need to talk to KH re: her hair. You're spot on Tracey... 1985 fo' sho'. THANK YOU TraceyR!!!! You saved me some surf time! That was driving me around the bend...90210!!!!! I agree on the age issue, to me it was just her looks that is closest for me! What about Emma Stone for Brianna? YES Sally!!! I think Kate Beckinsale would be the perfect Claire. She already has the accent. She's got the dark hair which can be curly as shown in Pearl Harbor, and "Whiskey" colored eyes =) She is also able to handle the leading role as she has proven any times. I like Katherine Heigel as an actress, but she is no Claire. PLEASE Don't mis-cast Claire or Jamie. This is so important to many people =) Jamie is going to be the difficult one to cast! I am SO happy they are going to make this into a movie but there is a CULT following. They have to do it right! !